In purchasing equipment for the outdoors, I always use the same thought process. How often am I going to upgrade my equipment based on the new radical improvements that the manufacturer will come out with? How long before my existing equipment will become obsolete and I will have to replace it? How long will it be before I have a disadvantage with my existing equipment? When the time came to choose a VHF radio, I decided that I would choose the best VHF Radio that I could afford based on the use of the VHF radio (and in this case, the least expensive model). Just in case you never knew, VHF is the abbreviation for Very High Frequency. When you choose your VHF radio, make sure it will perform in the temperature conditions that you plan to use it. One of the advantages of the VHF radio is that has a range of 5 miles and since the water is flat, the range is quite accurate. If there is an island in front of you with a hill, the VHF signal will probably not be able to go over the island as the signal needs nothing in front to have a range of 5 miles. VHF radios work everywhere (unlike cell phones) as the radio is self contained. Almost all of the features listed below are now on all VHF radios except the least expensive models. There might be up to 10 or more weather channels to choose from. Obviously, having the weather available at all times is a major benefit. Some VHF radios have a weather warning mode while conserving battery power. When a weather alert is broadcast, the VHF radio will beep or turn on the weather station so you are warned of apparent dangerous weather. Some VHF radios will scan channels and at the same time scan the weather channels. This feature can be set by you. When the VHF radio is set to the one watt setting, it uses less battery power. This is useful to conserve battery power when you need to talk to people close by. The VHF radio should have an automatic switch back to one watt mode if you haven't used it for a few minutes to conserve battery power. Check to make sure if the VHF radio is waterproof or water resistant. There is a big difference. If you capsize in your kayak, your VHF radio better be waterproof (submersible) or water resistant and enclosed in a waterproof bag. If the VHF radio has to be enclosed in a waterproof bag, make sure the controls can be used. If you have to use the VHF radio with neoprene gloves on, make sure you can control the buttons with gloves on. During darker hours, make sure the screen can be seen with larger channel numbers. Can the VHF radio be immediately set for an emergency. What are the steps necessary to jump to the correct channel that you might need? Let the salesperson demonstrate that for you. 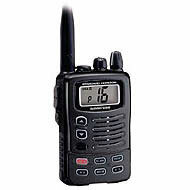 The VHF radio price can range from about $125 to $600 (depending on the features). Spend as much as you need to spend for all the important features that you need. There are two types of batteries used in a VHF radio - NiCad and Lithium. NiCad powered radios must have the batteries totally discharged before replacing the batteries and can usually use regular AA batteries for backup (check to make sure AA batteries can be used). Lithium powered radios can be recharged at any time so every time you go for a paddle, your VHF radio will be fully charged. This is a major difference and NiCad radios will only be fully charged whenever the batteries have been totally discharged. Some VHF models are made from tough plastic and some models are made with metal. Check the warrantee and the durability of the VHF radio based on your use. Don't forget to learn how to maintain your VHF radio correctly because incorrect methods might damage your VHF and choose a VHF radio wisely. Always remember to remove the batteries out of the VHF if you are not going to use it for over 6 months.